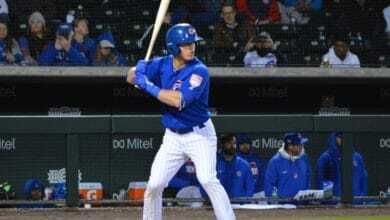 Welcome to Cubs Insider’s yearly organizational breakdown of each position in the Cubs’ system. Over the next two months, prospects at each position will be ranked and profiled, starting with the catchers. The Cubs look to be fairly settled behind the plate at the major league level with Willson Contreras and Victor Caratini, who are signed through 2022 and 2023, respectively. An issue going forward is that the switch-hitting Caratini might be more valuable as a trade asset than for the Cubs as a bench player. If that is the case this winter, the Cubs could be in the market for a veteran backup. That’s likely to be a short-term solution, after which they may once again look to the minors for help. There were a few surprises last summer when it comes to catching in the system. Two young guys blossomed a bit faster than anyone thought they might and it looks like there are two players from Rookie League to keep an eye on in 2019. He had a monster first half in Myrtle Beach, hitting .289 with a .387 OBP and 37 RBI in 69 games. As a result, Higgins was promoted to Double-A Tennessee, where he struggled a bit with the bat but not as a backstop. He hit only .158 in the Arizona Fall League, but showed off his defensive skills for Mesa; elite defense will likely be his calling card to get to the majors. Higgins is one of three catchers in this list who are eligible to be taken in the Rule 5 Draft on December 13, but he should be back in Tennessee if he’s still with the organization next season. Rice had a strange 2018. His approach at the plate was outstanding as he tallied a .386 OBP. But his power numbers just seemed to disappear as he only hit eight home runs and just drove in 30 in 88 games. Like Higgins, Rice is a Rule 5 candidate and some teams might fall more in love with his smooth uppercut swing than with his defense. He is improving, however, as he threw out 22 percent of attempted base-stealers in 2018. Myrtle Beach manager Buddy Bailey fell in love with Pereda’s skills in spring training and wanted to to take Pereda back to Myrtle Beach with him instead of letting him go back to South Bend. Sometimes things have a weird way of working themselves out, as Pereda broke out in the first half of 2018 with a .284 average, .368 OBP, and five home runs. He dropped 20 points in both as he wore down a bit in the second half, then wound up the year hitting .276 in the Arizona Fall League while throwing out base-stealers at almost a 40 percent clip. He is Rule 5 eligible as well, but is very unlikely to be selected since he’s never played outside of Class A.
It’s no surprise to see Amaya at the top. What is surprising is that his bat seems to be advancing faster than most thought it would. He hit nine dingers in the first half with a .282/,365/.500 slash. There were some issues in the second half at South Bend and Amaya wound up catching 5-6 times a week and wearing down a bit. Still, his performance in the Midwest League at just 19 years old was extremely impressive. He will be 20 next spring at Myrtle Beach and it will be interesting to see how long he remain there considering he projects to be an everyday catcher in the bigs. Alexander Guerra’s bat was pretty potent in Mesa last summer. Hitting .267 with a .355 OBP and 30 RBI in 48 games was an impressive debut and he should skip Eugene to start out at South Bend for 2019. Henderson Perez, who went only 5-foot-9 and 160 pounds as a 16-year-old, now looks like a weightlifter behind the plate. He can hit a little bit as well, posting a .311/.386/.411 slash with 15 RBI in 24 games for Mesa 2 in the Arizona Rookie League. He will still be only 19 next season and will likely start out at Eugene. Once a weakness in the organization, the Cubs have built their catching into a strength. How things shake out after the Rule 5 Draft and another year of development may determine what direction the Cubs take when it comes to the catching position in Chicago, but we’ve still got plenty of time before we need to worry about that.